Heat the oven to 375°F. Line the cupcake molds with muffin liners or cover in cooking spray. Combine the flour, salt and baking powder in a medium bowl. Add the butter and mix well. In another bowl, combine the egg and vanilla. Add this mixture to the flour mixture little by little and combine using a hand mixer or whisk. Add the berries and mix with a spatula. Fill each muffin mold 3/4 of the way full. Bake for 25-30 minutes or until a toothpick comes out clean when inserted into the center of one muffin. Transfer to a rack and let cool for 10 minutes. Serve lukewarm. You can use strawberries, chocolate chips, nuts or any fruit you like. You can also sprinkle a little bit of sugar on the surface before baking so they've got a little crunch to them. 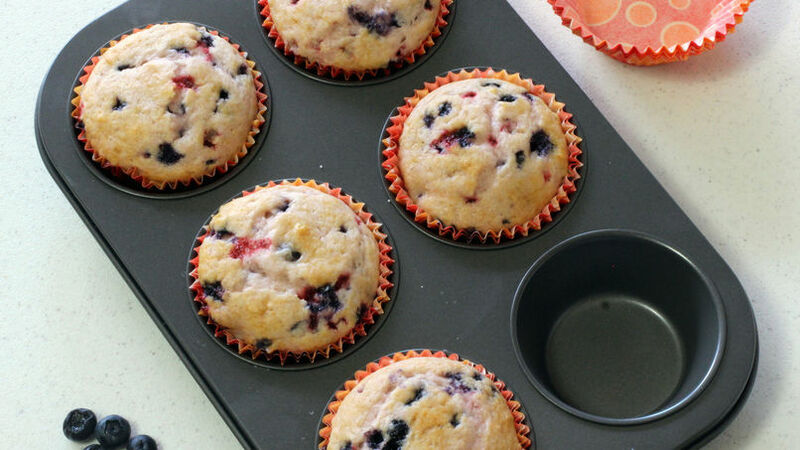 Muffins are delicious treats that can be served for breakfast, brunch or as a snack for school. At home, we sometimes like to make them on Sundays when we have the time. They're also a great snack for tea or coffee with friends.